2. Mince 3 cloves garlic and saute in 4 Tblsp olive oil. 3. chop 12 basil leaves. 5. Dice 1 log fresh mozarella. 6. In bowl combine baked spaghetti squash, minced garlic and olive oil, tomatoes, mozzarella, and basil. Place in 9×13 (lasagna pan) and bake at 350 until cheese bubbles. 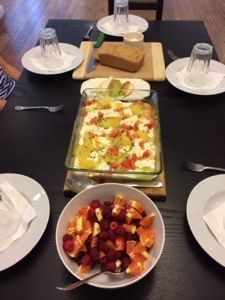 Tonight’s menu: spaghetti squash bake, tossed fruit (strawberries, raspberries, diced orange), pear slices, whole wheat bread with butter. feedback: People liked this. They ate it without complaints. Biggest hits were mozarella and pear slices.